Jonathan Gruber is an MIT economist who helped designed the Affordable Care Act. During the years after its passage, he gave many public talks, often in academic settings in which he was recorded saying rather dreadful things about the “stupidity of the American voter.” Some of my fellow economists, notably those who think ACA is bad policy, have defended Gruber on various grounds, mostly emphasizing academic freedom/honesty and the effect that his public humiliation this week dissuades policy scholars from public service. I think Grubergate has at least four important lessons, and none of them are favorable to Gruber. 2. The shaming of Jonathan Gruber will not dissuade competent, intelligent scholars from policy work. It might dissuade antidemocratic snobs. Good riddance, I say. Maybe I am too moralistic, but Gruber offends me. He offends the idealism I shared with young men and women who serve in the U.S. military. His disdain for honest dealing literally breaks the honor code we live by in the armed forces, and one I suspect most Americans live by in their daily lives. 3. Gruber’s analysis is not technically “correct albeit overly cynical” as Tyler thinks. It is an oxymoron to defend someone’s honesty when they are being honest about deception. What Gruber represents is a trend in legislative complexity, a trend that elites justify for getting their policies enacted but which strikes me as undemocratic in the most fundamental way possible. Citizens of a republic are rightly hostile to the bureaucratic state, and not because they are less intelligent than their representatives. It is because they have an innate sense of self-dealing, exactly the kind of dangerous legal corruption that Public Choice warns us about. We should see this as a case study in government failure. I’m thinking of Jonathan Rauch’s demosclerosis. 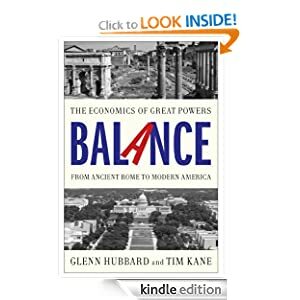 Glenn and I wrote BALANCE as a warning about how great power declines. We emphasize things like centralization and government failure. I doubt any ruler is fully aware of causing his country’s demise, nor do I suspect Gruber is aware that he is complicit in it here. But I think that is precisely what is at stake. Simple laws are better laws. And I have much more faith in democracy than any kind of elite rule. The corruption of democracy is what worries me. 4. There is a case now before the Supreme Court about the design of the ACA’s subsidies. The law is clearly written that subsidies for buying insurance are available to consumers who utilize exchanges established by the states. A concern expressed by Gruber and other architects was that some states would be reluctant to establish exchanges, but the architects wanted the program to have a facade of federalism, so they engineered a huge incentive to make it happen – the states-only subsidies. What these wise fools did not expect was that the hyper-partisan ACA would be rejected by many Republican-leaning state legislatures. Consequently, the federal government faced a large demand for a centralized exchange set up as healthcare.gov. Its catastrophic failure was only fitting justice, a fitting return for hubris of elite complexity. Well, now Gruber says the subsidies were intended for the federal exchange as well. Do you believe him? He is lying, and that seems obvious if you study the case. I do not think the Supreme Court will reward this revisionist dishonesty. It will be sweet justice and sweeter policy for the ACA to fail. It will nudge the Congress to free the health care market once and for all. If only all such elitist law met such a demise. Unfortunately, our generation has many more fights against dysfunctional complexity ahead, and few will be this easy.